In Chennai, India, a ‘plastic road’ in the city’s busy Nungambakkam area has withstood a major flood, several monsoons, heat waves and non-stop traffic in the form of cars, trucks and auto rickshaws. Built in 2002, the road in Jambulingam Street was one of the country’s first plastic roads. It is made of tar, held together with a polymer-based glue made from shredded plastic waste, and unlike conventional roads, it has not developed any cracks or potholes. The idea of using a plastic polymer-based glue to bind India’s roads first came about 15 years ago in response to the growing problem of plastic litter in the streets (including discarded plastic cups, single-use plastic bags and foam packaging). It has proved to be a durable solution, winning support among scientists and policymakers in India as well as neighbouring countries like Bhutan. Today, there are more than 21,000 miles of plastic roads in India, mostly in rural areas, with approximately half of them in the southern state of Tamil Nadu. Commercially-made polymer-modified asphalts are already in use in Europe and North America. Often made from virgin polymers (and sometimes ground tyres), they are highly versatile, tending not to buckle in extreme heat. The ‘melting point’ for plastic roads is around 66°C, compared to 50°C for conventional roads. Plastic roads are also cost-effective, making use of waste as opposed to virgin materials. Every kilometre of plastic road uses the equivalent of 1m plastic bags, saves around one tonne of asphalt and costs roughly 8% less than a conventional road. The first motorway (connecting Chennai with Villupuram) using a plastic-polymer based glue was tested in March 2016, and is expected to reduce construction costs by 50%. However, using plastics in roads can have an effect on the environment in the long term. Old or poorly built roads may shed plastic fragments into the soil and waterways when they deteriorate. These ‘microplastics’ attract pollutants such as polychlorinated biphenyls (PCBs) and can have an impact on their surroundings. Despite this, the Indian government the Indian government announced in November 2015 that plastic roads would be the default method of construction for most city streets, part of a multibillion-dollar overhaul of the country’s roads and highways. 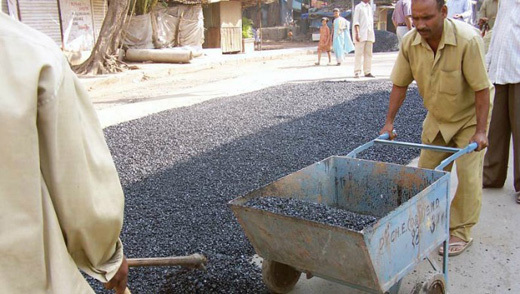 Urban areas with more than 500,000 people will now be required to construct roads using waste plastic. This is also helping to create employment, since small companies are springing up to shred plastic waste needed to make the glue.